The best Lock App on Symbian! With this one, you do not need any other lock apps! Maze Lock can help you eliminate the cases of accidental key presses, phone calls or unwanted access to your device! The lock and unlock style are really cool as well! N8 Fan Club. You can set your own secret pattern to unlock your phone! And just draw your pattern connecting the dots and unlock your device. Tips: If you forget your password for accessing, please email MMMOOO team, they will help you! Compatible with S^3 / Anna / Belle Smart Phones. 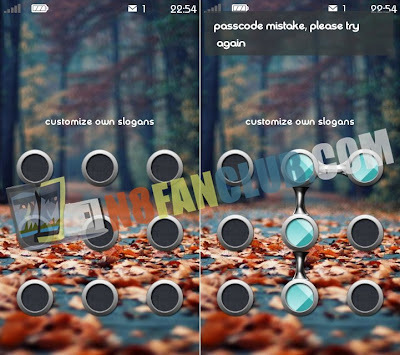 This upgrade we do more optimization, and it support customized lock screen wallpaper & also can switch off/on the unlock sound, maze lock is more perfect now! v1.50 has some strange GPS issues, it starts display blinking GPS icon, however it shall be fixed in next version.